Home/Manuka Oil, Molluscum Contagiosum, Natural Treatments, Skin, Warts/What is Molluscum Contagiosum? Natural Treatment Alternatives that work. Molluscum Contagiosum is a common and harmless viral infection of the skin. It is contagious (can be caught from another person by direct contact). It is common for children and young adults but can occur at any age. In children, the condition is quite easy to recognise. Molluscum Contagiosum virus causes small painless, pink or pearly white lumps that can appear virtually anywhere on the body. The top of the lump is indented and contains a white core. The infection is not severe, as it only affects the skin and will disappear without treatment although this may take several months. Individual lumps often disappear after about two months, but often there will be more than one lump, and they will not disappear until 6 to 9 months. In some case, the virus can last for up to 2 years. There are no long-term ill effects following Molluscum Contagiosum. People who are immune suppressed may have more lesions and these may take longer to clear up. Molluscum Contagiosum is a common viral skin infection member of the Pox virus family. Also known as Water Warts or Dell Warts. Molluscum Contagiosum is common worldwide with an estimated 170 million sufferers, 3% of the world’s population. The average length of Molluscum Contagiosum infection is just over 12 months. Molluscum Contagiosum infection is commonly transmitted to other children in the family. 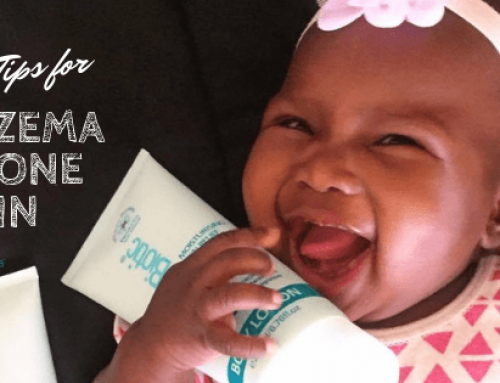 A recent study has shown that an abnormality in the gene that helps to maintain the skin barrier has been closely linked to the onset of eczema. A defect in the skin barrier makes the skin more susceptible to a variety of skin infections and irritations and allows allergens to penetrate the skin, causing itching and inflammation. Usually, these skin lesions are asymptomatic, but the spots can be very itchy or sore if they become inflamed or infected. If children pick at the bumps, this can cause them to spread further since they are highly contagious. (And we all know how good our little ones are at picking at spots and scabs). There can also be areas of redness on the skin, or eczema can appear around the spots. The virus is transmitted by direct skin-to-skin contact where there are minor breaks in the skin and is most common in children. The Molluscum Contagiosum virus usually spreads by direct close personal contact from person to person e.g. from family members or other infected children with whom they swim or bathe, or by sharing towels. The incubation period from becoming infected and developing symptoms can vary between about 2 to 24 weeks. The condition itself, if left untreated will eventually disappear, but this could take up to 2 years or more. Yes, but it is highly contagious and can be contracted directly and indirectly from an infected person or a contaminated toy or object. Your family’s overall hygiene needs to be controlled by washing your hands often. Change pillows and clothes more frequently and bath towels daily. Don’t use soap bars, use liquid soap instead. Don’t scratch bumps and cover any pus head Molluscum lesion with adhesive bandage or clothing. Don’t share towels, toys or clothing. Some advice and treatment vary from “there’s no treatment” to “it will disappear in a year or two”, to freezing with liquid nitrogen until they clear, cauterising, squeezing, popping cutting and burning the spots. Other “treatments” include benzyl peroxide, Betadine, and Burrow’s solution (aluminium acetate). 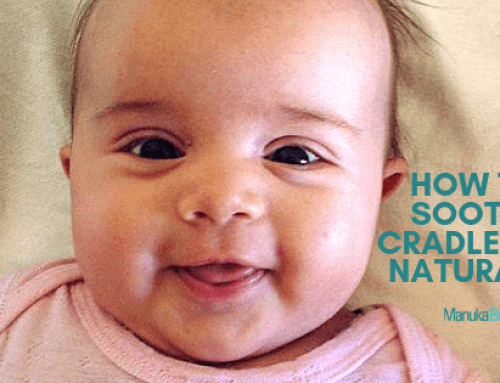 None of these methods are satisfactory, and some can be quite distressing for young children, and they can result in scarring. What about Popping The Molluscum Contagiosum? When you pop Molluscum Contagiosum bumps, the skin is broken, exposing the inside of the bump. If you have done this before, you may have noticed a white gooey substance. It is where the virus is contained and is the most contagious part. It is very risky to pop your bumps and expose your body to the most contagious part of the disease. Doing so may cause the virus to spread, and more bumps may appear. It will not eliminate your Molluscum Contagiosum; it can make it even harder to treat and eliminate. 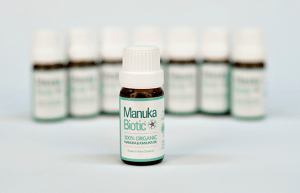 Manuka Biotic® Manuka Oil is sustainably harvested from the leaves of Manuka trees, extracting the oil through steam distillation on our farm in the Coromandel, New Zealand. 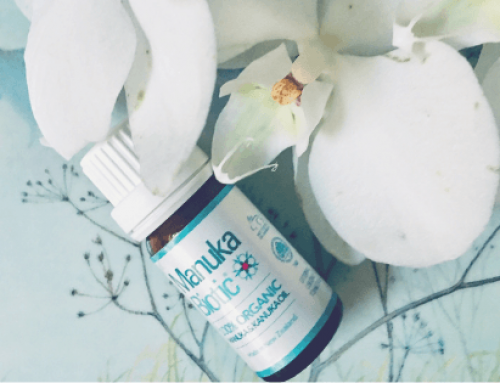 Our Manuka Oil is the only certified organic Manuka Oil in the world. Manuka Oil is for external use only. 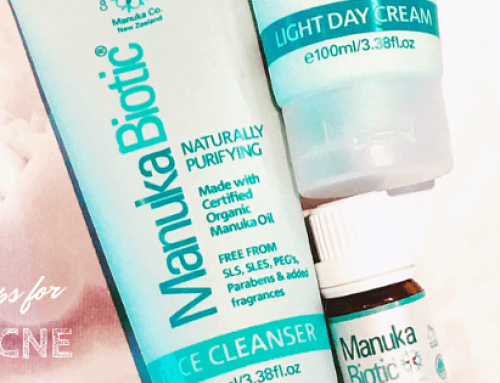 Manuka Biotic® Body Lotion: Thick in texture and rich in emollients, the Manuka Biotic® Body Lotion moisturises even the driest of skin, creates an effective barrier, reduces inflammation, and fights bacteria. 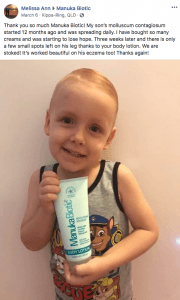 Our Manuka Biotic® Body Lotion is designed to hydrate and soothe dry, eczema prone skin, aid in healing wounds and soothing irritated skin conditions. We combine Manuka Oil with rosehip oil, jojoba oil, shea butter and vitamin E.
Manuka Biotic® BodyWash: Containing Manuka Oil our Body Wash is antibacterial and anti-inflammatory and can help reduce the bacteria on the skin and help contain the Molluscum contagiosum virus. Neem Oil: For thousands of years, neem has been trusted as a reliable medicinal herb, particularly in India, where it is known as a powerful antiviral substance. This is known as an exceptional topical application for various skin conditions, and for Molluscum Contagiosum, Neem can effectively neutralize and eliminate the virus. You can boil neem leaves in water and then topically apply this infused water to the affected areas on the skin. You can also bathe with this water. Apple Cider Vinegar: This treatment is more harsh and aggressive, and while it sometimes leads to positive results, often comes along with some amount of skin irritation. The apple cider vinegar’s acidity kills the virus and eliminates lesions. We recommend that if you do use an apple cider vinegar wash over the infected skin daily, that after you dry off, to apply the Manuka Biotic® Body Lotion, which will help to soothe the skin and provide an antibacterial cover to the skin. Tea Tree Oil: For treating a wide variety of skin conditions, including eczema and psoriasis, tea tree oil is a trusted, side-effect-free solution that can be directly rubbed on the affected bumps and lesions. Use a cotton ball, as with the apple cider vinegar approach, and dab the bumps 3-4 times per day. Tea tree oil can eliminate the bumps and prevent them from returning within a week or so. Allicin: Garlic is one of the most versatile herbal remedies in the world, primarily due to its high allicin content. Allicin contains powerful antiviral and antibacterial compounds that can rapidly neutralize most viral strains, and rubbing a poultice of garlic that has soaked overnight is an easy and effective home remedy for these irritating lesions. Alcohol: Plain alcohol can be a simple and effective way to eliminate Molluscum contagiosum. Apply the alcohol to the skin and cover the area; it is a natural immune protector and can kill infections. That is why alcohol is applied to wounds, to prevent infection. The alcohol can soak into the lesions and neutralize the virus. The lesions will lower and disappear within a matter of days. Coconut Oil: One of the most powerful natural remedies for skin conditions is coconut oil, which boasts antifungal, antiviral, and antibacterial properties. By rubbing this oil directly on the affected skin areas, you can quickly reduce the inflammation and itchiness, and also kill the virus, thus clearing up the condition. Oregano Oil: Although many people think of oregano simply as a spice, oregano oil boasts a wide range of antioxidant compounds, including thymol, terpenes, carvacrol, and rosmarinic acid. All of these components help to reduce the inflammation of the infected areas and boost the immune system to fight off the Molluscum contagiosum virus. In the early stages, you won’t see much change; in fact, it is common for the spots to spread further at the beginning of treating them. It takes some time for the bio-actives in the Manuka Oil to act on the immune system and prepare it for destroying the virus, so try to persevere. Remember, Molluscum Contagiosum is not harmful, just unsightly. So keep working on the twice-daily application of a little Manuka oil and Body Lotion and spread it over the spots. It does not need to be rubbed into the skin. Once the body starts attacking the Molluscum you might see redness, some swelling, crusting and maybe even drainage of the area. This is the ‘beginning of the end’ sign and means the bumps are clearing. It may take anywhere from 3 weeks to 3 months to clear once this inflammation response is seen. Definitely, talk with your doctor if there is any concern. We don’t recommend using any pure essential oil on children under the age of 4 years old, without adding to a carrier oil, such as pure olive oil or coconut oil, as it can cause irritation or an allergic reaction. We always recommend that you test a small, unaffected area of skin with the manuka oil, and if there is no reaction within 24 hours, it should be safe to use. You can read how to do this test here. Another big, big part of recovering from the Molluscum Contagiosum virus is getting your little one’s immune system as strong as possible. The body will recognise and combat the virus, but not if it’s already busy fighting the flu or colds – so start getting your little one (or yourself) as healthy as possible. Although almost all nutrients in the diet play a crucial role in maintaining an optimal immune, any zinc- deficient persons, experience increased susceptibility to a variety of pathogens. Numerous studies have shown the relationship of zinc deficiency with infections and the benefits of zinc on these diseases in humans. The role of zinc has been well observed in the treatment of certain dermatological conditions like chronic viral warts, herpes, cutaneous leishmaniasis, to name a few. If possible, start with prevention. If a family member has the condition, avoid the sharing of baths, towels and close contact with other children. As any parent would know, this is not always easy to achieve. Following these steps can help prevent the spread of Molluscum Contagiosum. A tip for keeping toys and play area clean is to mix up some apple cider vinegar and Manuka oil into a spray bottle and spritz this over the toys and play area. You can use the same combination above with hot water to mop your floors. Many people have dealt with the virus and found ways to manage the stress that comes with it. Consider joining our Facebook page, to connect with other Mum’s people who are going through this with you. 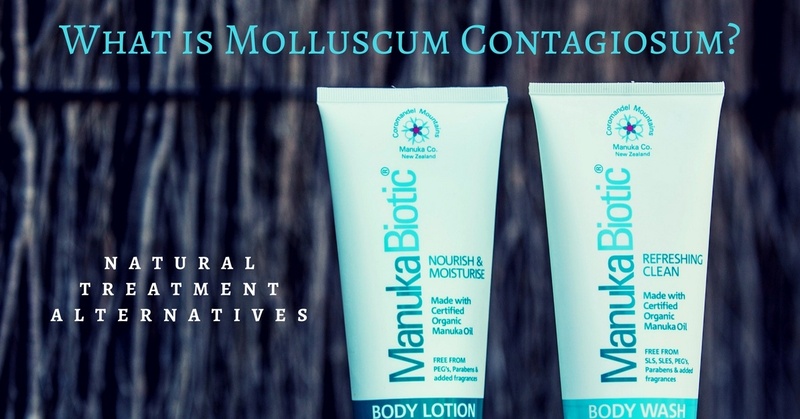 We have many Manuka Mum’s who have shared their story online for those struggling with stress and anxiety from Molluscum Contagiosum, as well as many other itchy skin conditions. Do not be afraid to reach out – we love to hear from our Manuka Mum’s community, and we understand what you are going through. Check out the following website for further information on how you can treat and prevent the condition. Remember, your health provider will also be able to offer assistance with assessing and treating your symptoms. DermNet New Zealand – All about the skin – This organisation has an excellent website. A full list of skin condition facts, forums, blogs, education and a support line, to help improve the lives of people living with molluscum contagiosum. Please read the full ingredient list for any known irritants or allergies. We advise trying new products on a small patch of skin and waiting 24 hours to make sure there is no reaction. Any natural product on the market could contain an ingredient that won’t agree with your skin. You can read more about how to do this here. 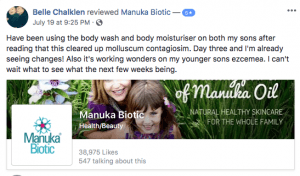 Hear directly from a few of our lovely Manuka Mum’s sharing their experiences of using our Body Lotion, Body Wash and Manuka Oil on their little ones Molluscum Contagiosum click on the images below. 1: An epidemic study of molluscum contagiosum. Relationship to swimming; Niizeki K, Kano O, Kondo Y. 1984. 2. Experience with Molluscum contagiosum and associated inflammatory reactions in a pediatric dermatology practice: the bump that rashes;Emily M. Berger, MD; Seth J. Orlow, MD, PhD; Rishi R. Patel, MD; Julie V. Schaffer, MD. 2012. 3.Molluscum contagiosum: the importance of early diagnosis and treatment;Tyring SK. 2003. M. Berger, MD; Seth J. Orlow, MD, PhD; Rishi R. Patel, MD; Julie V. Schaffer, MD. 2012. 5.The epidemiology of molluscum contagiosum in children; Dohil MA, Lin P, Lee J, Lucky AW, Paller AS, Eichenfield LF. 2006. 6: Epidemiology and impact of childhood molluscum contagiosum: a case series and critical review of the literature; Choong KY, Roberts LJ. 1999. 7: Molluscum contagiosum, swimming and bathing: a clinical analysis; Braue A, Ross G, Varigos G, Kelly H. 2005. 8.Clinical characteristics of molluscum contagiosum in children in a private dermatology practice in the greater Paris area, France: a prospective study in 661 patients; Osio A, Deslandes E, Saada V, Morel P, Guibal F. 2011. 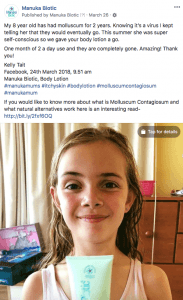 9.Molluscum contagiosum: to treat or not to treat? Experience with 170 children in an outpatient clinic setting in the Northeastern United States; Hatice Basdag M.S., Barbara M. Rainer M.D. and Bernard A. Cohen M.D. 2015. 10. Time to resolution and effect on quality of life of molluscum contagiosum in children in the UK: a prospective community cohort study; Jonathan R Olsen, MSc, Prof John Gallacher, PhD, Prof Andrew Y Finlay, FRCP, Prof Vincent Piguet, FRCP, Nick A Francis, MRCGP. 2015.